In KRANBAHN, I would like to apply the forces that actually act simultaneously on the two supports from the crane runway. Can I read these out somewhere? 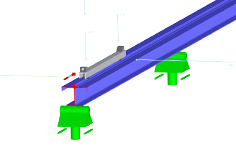 The prerequisite for an output of the MAX / MIN bearing reactions with associated values on the other crane runway girder is the design of both girders in KRANBAHN. To do this, select the option "Both carriers (R max and R min ) in Mask 1.4 Load. See picture 01. "Max / min only" can be selected. The results are then determined for both carriers (carriers with R max and carrier with R min ) arranged according to the individual load components and the supports indicated. There are two output lines per support and load component.